Men aren't trained to take the temperature on their marriages and check if it's in good health. They tend to leave that up to their wives, so it can come as a huge shock when she tells him "I don't love you anymore." OK, he sort of knew she hadn't been happy but thought that if he kept his head down it would blow over. However, she's not saying "there's a problem we need to fix" but that "it's over and we need to tell the kids and split up." Suddenly, the bottom has dropped out of his world. He doesn't know where to turn, how to make sense of what she's saying and worse still how to start fixing the problem. His friends will offer a drink to cheer him up but no practical advice and media aimed at men is full of sport, politics and business. He's in a spin, begging for another chance and telling her "I still love you" just makes her colder and even more angry. When it's time to admit it's over and what factors indicate you should still fight the good fight Whether she's told you "I don't want to work it out", "my feelings won't change", or the heart wrenching "I'm attracted to someone else", this book can help you turn it all around and provide scripts to make her open her heart again. It is almost 10 years since the first person arrived in my marital therapy room having told their partner: 'I love you but I'm not in love with you.' As a result I wrote an article for the Observer newspaper in the UK about couples splitting up not because they hated each other but because one partner had fallen out of love. The response was overwhelming and I was asked to write the book, I Love You But I'm Not In Love With You: Seven Steps To Saving Your Relationship (Bloomsbury). It turned out to be not just a UK phenomena: the book has been translated into German, French, Italian, Chinese, Japanese, Swedish, Greek, Turkish—in fact, 15 languages and counting. I also became the first UK-based self-help writer to be published by HCI (the US publishing giant behind the best-selling Chicken Soup for the Soul series). Back in 2006, when the book was published, I thought I'd written everything that needed to be said on I Love You But . . . However, it was aimed at both the person who had fallen out of love and their partner. I didn't cover the differences between when a man falls out of love and when a woman falls out of love, because I didn't want to make generalizations about all women this or all men that. My sample of cases were all couples who were committed enough to saving their relationship to phone Relate (the UK's leading couple counseling charity), book an appointment for an initial assessment and wait the weeks and sometimes months to start on-going counseling. However, desperate letters to my website (www.andrewgmarshall.com) told a different story—one where women and men told their partners they'd fallen out of love and either immediately or a few days later declared that the relationship was over. They couldn't 'change' their feelings, they needed 'space' and the children should 'be told.' There was 'no point' going into counselling and if the person who had fallen out of love did reluctantly agree, it was just to check the box that said 'we tried everything.' These correspondents had found my book incredibly helpful and had drawn hope from my message that you can fall back in love again, but wanted to know how to communicate this to their partner. The more letters I received and the more stories I heard, the more I began to realize it was a completely different experience being a man told I love you but . . . rather than a woman. Time and again, these men were isolated and didn't know where to turn for support. They had always taken their emotional problems to their wives. Their friends might have offered a beer and the chance to take their mind off their problems but not much else. They were on their own. Worse still, these men were making simple mistakes that not only deepened their depression and anxiety but actually pushed their wives further away. By 2010, I had set up in private practice and the majority of my clients were couples where one partner had fallen out of love. I knew I had to write a book targeted specifically at men when a male client had been so overwhelmed by panic that he'd undone all the good work of the previous session over the subsequent week. Desperate for reassurance from his wife that there was still hope, he had been using her guilt about hurting their children to try and force her to stay, I told him that short of phoning his wife a taxi, he'd done everything ­possible to push her out of the door. Both the husband and the wife laughed because it was horribly accurate. Sadly, I couldn't save their marriage—partly because they arrived too late, but mainly because the husband didn't need just weekly therapy but regular coaching too. So what's the difference? Counseling, or therapy, is about helping someone open up, explore their feelings and ultimately find their own solutions. It works best when the peak of a crisis is over and the dust has settled a bit. However, my male client did not need to get in touch with his anxiety but to manage it better. And that's where coaching comes in. Coaching is about sharing knowledge (gained from previous experience in the trenches of a problem). It offers practical suggestions and helps you rehearse your messages to your partner. Ultimately, coaching is about keeping you focused and stopping you from turning a crisis into a disaster. In an ideal world, if your partner has fallen out of love, you should be in couple counseling, working through the issues together as well as getting personal emotional support. In this book, I will help you decide who would be best to turn to and who you should definitely avoid. Unfortunately, we don't live in an ideal world so I Love You But I'm Not In Love With You can be your couple's counseling and My Wife Doesn't Love Me Anymore can be your personal love coach. When I counsel men face-to-face, I write down the main lessons from each session for them to take away. I've done something similar for you with the 'Love Coach's Three Key Things to Remember' at the end of each chapter. Ultimately it doesn't matter which order you read the books but please don't skip I Love You But I'm Not In Love With You as it covers some of the techniques and ideas for saving your marriage in more depth. If you're currently holding both books in your hand (or have both e-books), I would start with I Love You But I'm Not In Love With You. I have used the word 'wife' rather than 'partner' in the title because I wanted to immediately indicate this book is targeted at men. However, let me be clear: this is a book for all men in committed relationships, whether married, living together or separated. I'm also going to have to make blanket statements about being a man, even though I know there are countless exceptions. Having said that, there is also truth in many generalizations. So even if something strikes you as 'yes but . . .' please stay with me because although you might not personally fall completely into any stereotype, it will illuminate how you might be coming across to your wife and an extreme example will often demonstrate more clearly what you might need to change. ©2014 Andrew G. Marshall. All rights reserved. 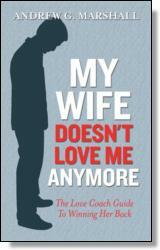 Reprinted from My Wife Doesn't Love Me Anymore: The Love Coach Guide to Winning Her Back. No part of this publication may be reproduced, stored in a retrieval system or transmitted in any form or by any means, without the written permission of the publisher. Publisher: Health Communications, Inc., 3201 SW 15th Street, Deerfield Beach, FL 33442.